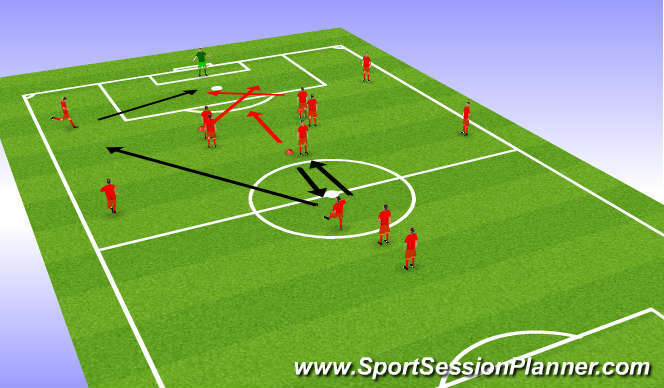 1/ Deep lying midfielder plays a pass into the attacking midfielder who, having cheked to receive, sets the ball back. 2/ A longer pass is then played to either the full back or wide forward. 3/ Combination play between the wide forward and the full back proceeds a cross into the box. Attacking midfielder looks to join forwards in getting into the box. 4/ A pair of forwards (from the four situated on the cones outside the box) make darting runs into the box to meet the ball. 5/ Deep lying midfielder who plays the initial pass becomes the attacking midfielder. Attacking midfielder joins the back of the deep lying queue. * The practice is continuous with both sides of the pitch being worked and pairs of forwards alternating. - Allow wide men to combine with attacking midfielder - Instigates the use of third man runners - e.g. wide forward receives, drives inside, passes to the attacking midfielder who bounces the ball to the overlapping full back to cross. - Add two central defenders to add an element of realism in the penalty area. *Leads nicely into half pitch practice focusing on attacking principles.